HOW WILL MY BABY BE HAPPIER With Beaming Baby Size 5 Diapers? YOUR HAPPINESS GUARANTEED with Beaming Baby Junior Diapers! 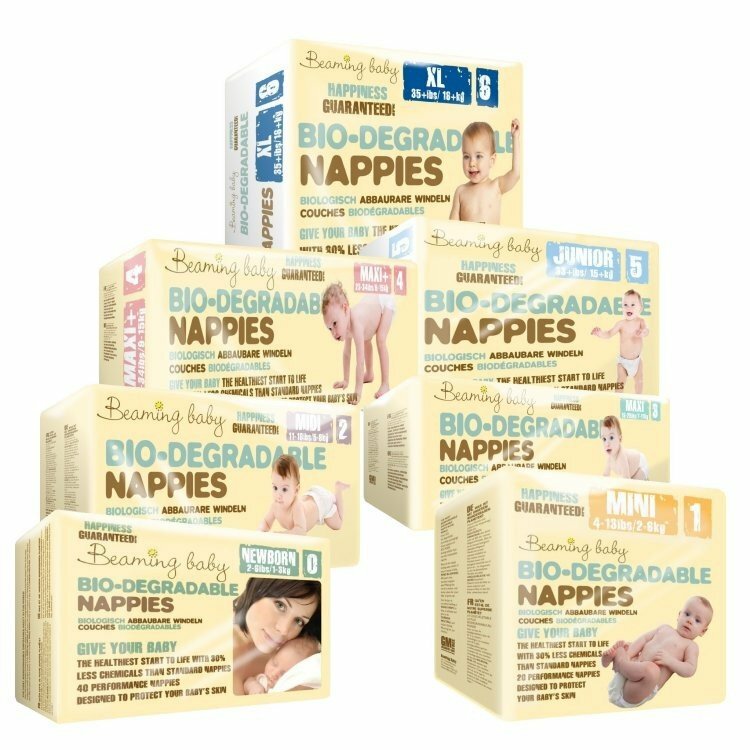 Beaming Baby Bio-Degradable Diapers Size 5 are Totally Chlorine Free and contain only Clean Plastics which are used in the Velcro patch and elasticated back and side panels. I've just come back to beaming babies diapers to save my son from heat rash. There is such a noticeable difference and improvement in his skin condition in these diapers, which I put down to the breathable, non-plastic materials. I love the beaming baby bio degradable diapers. Firstly because of the more natural materials they are made with. My baby hardly has any rushes. They fit well and they never really leaked other than once or twice when my little one was really poorly. Highly recommended! Very good diapers and biodegradable. Very good diapers, never leak, even overnight (~11 hours). I would definitely recommend them. We have tried a few other diapers occasionally but these have been our diapers of choice since a couple of months old. The sizing is a bit small. The Junior diapers fit our 12kg toddler perfectly. This is the BEST diaper on the market because it has never leaked even after 12 hours a night, my little one sleeps throught the night since she was 3 months and 2 weeks old. It's also environmentaly friendly I have read that this diaper has won an award and would like to Congratulate it because it truly deserves it. All good. Good quality, they keep in what needs to be kept in! The other organic products have also been very much appreciated." Great product, love that they have less chemicals. Great service. always brilliant service and great products! Always brilliant! Thankyou for your products! Lovely product. Supermarket diapers go gel-like when wet but these don't and feel better. Great quality, really happy with the product and service.